"These minutes of the Town of Carroll Planning Board have been recorded by its Secretary. of New Hampshire RSA 91-A:2." �Are you in favor of adoption of Amendment #1 as proposed by the Selectmen for the Town�s Zoning Ordinance as follows? 1. One story detached accessory building limited to 200 square feet that has no plumbing and is not to be used as living space for people and provided that the siting of the structure meets set back requirements. 2. Fences not over 6 feet high. 3. Water tanks supported directly on grade, if the capacity does not exceed 5,000 gallons and the ratio of height to diameter does not exceed 2 to 1. 4. Sidewalks and driveways not over 30 inches above grade. 6. Swings and other playground equipment. 7. Prefabricated swimming pools less than 24 inches deep. 8. Window awnings supported on the exterior wall that do not project more than 54 inches from the exterior wall. 9. Interior improvements that do not increase the footprint of the building and do not increase the value of the structure by more than 25%. A motion to adopt this amendment and pass it on to the selectman was made by Evan Karpf, seconded by Connie Oliver, and passed unanimously. John Birknes presented a new Planning Board Subdivision Notice (copy attached) that he proposed be attached to any application for subdivisions. This notices deals with two issues: consultant review fees and posting of surety. Final mylars will not be endorsed as approved until payment is made for consultant expenses, and major subdivisions must provide sufficient surety to guarantee that all infrastructure construction is complete. This surety may be in the form of bond or cash. A motion to approve the use of this notice was made by Charles Cohn, seconded by Evan Karpf, and passed unanimously. The proposed Aquifer Protection Ordinance (APO) was the next item on the agenda. Evan Karpf has been in contact with Paul Susca from the DES regarding state mapping of aquifers and is waiting for a district map that will overlay the town�s zoning map. In order to implement the APO, the town must define the well head area and classify the level of protection for ground water. Al Strasser suggested that Phil Glazier be contacted as he previously owned land in the aquifer area and had researched this information. As a follow up to the APO, the Evan Karpf will go before the Select Board on December 12 to present the request form to the state to reclassify our ground water protection to the highest level. This request must come from the Selectmen. A motion was made by Even Karpf to submit the Aquifer Protection Ordinance with changes, seconded by Charles Cohn, and passed unanimously. A motion to submit the reclassification request to the Selectmen was made by Charles Cohn, seconded by Evan Karpf, and passed unanimously. The Town of Carroll hereby adopts this ordinance pursuant to the authority granted under RSA 674:16 and 674:21. The purpose of this ordinance is, in the interest of public health, safety, and general welfare, to preserve, maintain, and protect from contamination existing and potential groundwater supply areas and to protect surface waters that are fed by groundwater. The purpose is to be accomplished by regulating land uses which could contribute pollutants to designated wells and/or acquifers identified as being needed for present and/or future public water supply. 1. Aquifer: a geologic formation composed of rock, sand, or gravel that contains significant amounts of potentially recoverable water. 2. Groundwater: subsurface water that occurs beneath the water table in soils and geologic formations. 3. Impervious: not readily permitting the infiltration of water. 4. Impervious surface: a surface through which regulated substances cannot pass when spilled. Impervious surfaces include concrete unless unsealed cracks or holes are present. Asphalt, earthen, wooden, or gravel surfaces which could react with or dissolve when in contact with the substances stored on them are not considered impervious surfaces. 5. Junkyard: an establishment or place of business which is maintained, operated, or used for storing, keeping, buying, or selling junk, or for the maintenance or operation of an automobile recycling yard, and includes, and includes garbage dumps and sanitary landfills. The word does not include any motor vehicle dealers registered with the director of motor vehicles under RSA 261:104 and controlled under RSA 236:126. 6. Outdoor storage: storage of materials where they are not protected from the elements by a roof, walls, and a floor with an impervious surface. 7. Public water system: a system for the provision to the public of piped water for human consumption, if such system has at least 15 service connections or regularly serves an average of at least 25 individuals daily at least 65 days out of the year. 8. Regulated substance: petroleum, petroleum products, and substances listed under 40 Code of Federal Regulations 302, of the July 1, 1990 edition, excluding the fo;;owing substances: (1) ammonia, (2) sodium hypochlorite, (4) sodium hydroxide, (5) acetic acid, (6) potassium hydroxide, (7) potassium permanganate, and (8) propane and other liquified fuels which exist as gases at normal atmospheric temperature and pressure. 9. Sanitary protective radius: the area around a well which must be maintained in its natural state as required by Env-Ws 378 or 379 (for community water systems) and Env-Ws 372.13 (for other public water systems). 10. Secondary containment: a structure such as a berm or dike with an impervious surface which is adequate to hold at least 110% of the volume of the largest regulated substance container that will stored there. 11. Snow dump: for the purposes of this ordinance, a location where snow which is cleared from roadways and/or motor vehicle parking areas is placed for disposal. 12. Stratified- drift acquifer: a geologic formation of predominately well-sorted sediment deposited by or in bodies of glacial meltwater, including gravel, sand, silt, or clay, which contains sufficient saturated permeable material to yield significant quantities of water to wells. 13. Surface water: streams, lakes, ponds, and tidal waters, including marshes, water courses, and other bodies of water, natural or artificial. 14. Wellhead protection area: the surface and subsurface area surrounding a water well or wellfield supplying a community public water system through which contaminants are reasonably likely to move toward and reach such water well or wellfield. The Acquifer Protection District is an overlay district which is superimposed over the existing underlying zoning districts and it imposes additional requirements and restrictions to those of the underlying, base district zoning. In all cases, the more restrictive requirement(s) and permitted uses shall apply. The boundaries of the Acquifer Protection District shall be the contact of sand and/or gravel deposits with other geologic deposits or boundary conditions within the subsurface, initially mapped as the boundary of the stratified-drift acquifer on Carroll Drinking Water Resources Map dated ________ by the New Hampshire Department of Environmental Services. 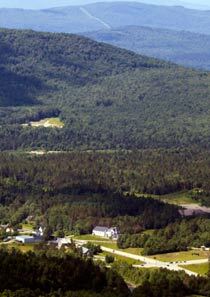 The Planning Board may adjust the mapped boundary of the District to make it consistent with the above definition of the District, upon the recommendation of a professional geologist using 1:24,000 scale surficial geology maps prepared by the New Hampshire Geological Survey, other existing data (including wells, borings, or other excavations of sufficient depth), or appropriate field testing methods. This Ordinance applies to all uses in the Acquifer Protection District, except for those uses exempt under Section 10011 of this Ordinance. 1. For any use that will render impervious more than 15% or more than 2,500 square feet of any lot, whichever is greater, a stormwater management plan shall be prepared which the planning board determines is consistent with Stormwater Management and Erosion and Sediment Control Handbook for Urban and Developing Areas in New Management Practices for Urban Stormwater Runoff, January 1996. 2. Stormwater management plans shall demonstrate that stormwater recharged to groundwater will not result in violation of Ambient Groundwater Quality Standards (Env-Ws 410.05) at the property boundary. 3. Animal manures, fertilizers, and compost must be stored in accordance with Manual of Best Management Practices for Agriculture in New Hampshire, NH Department of Agriculture, Markets and Foods, August 1998, and any subsequent revisions thereto. 4. All regulated substances stored in containers with a capacity of 5 gallons or more must be stored in product-tight containers on an impervious surface designed and maintained to prevent flow to exposed soils. floor drains, and outside drains. 5. Facilities where regulated substances are stored must be secured against unauthorized entry by means (a) of door(s) and/or gates(s) which is (are) locked when authorized personnel were not present and must be inspected weekly by the facility owner. 6. Outdoor storage areas for regulated substances must be protected from exposure to precipitation and must be located at least 50 feet from surface water or storm drains, at least 75 feet from private wells, and outside the sanitary protective radius of wells used by public water systems. 7. Secondary containment must be provide for outdoor storage of regulated substances if an aggregate of 275 gallons or more of regulated substances are stored outdoors on any particular property. 8. Containers in which regulated substances are stored must be clearly and visibly labeled and must be kept closed and sealed when material is not being transferred from one container to another. All uses permitted by right or allowed by special exception in the underlying district are permitted in the Acquifer Protection District unless they are Prohibited Uses or Conditional Uses. All uses must comply with the Performance Standards unless specifically exempt under Article XI. 1. The siting or operation of a hazardous waste disposal facility as defined under RSA 147-A. 2. The siting or operation of a solid waste landfill. 3. The outdoor storage of road salt or other deicing chemicals in bulk. 4. The siting or operation of a junkyard. 5. The siting or operation of a snow dump. 6. The siting or operation of a wastewater or septage lagoon. 1. Storage, handling, and use of regulated substances in quantities exceeding 100 gallons or 800 pounds dry weight at any one time provided that an adequate plan is in place to prevent, contain, and minimize releases from catastrophic events such as spills or fires which may cause large releases of regulated substances. In granting such approval the Planning Board must first determine that the proposed use is not a prohibited use and will be in compliance with the Performance Standards as well as all applicable local, state and federal requirements. The Planning Board, at its discretion, may require that a performance guarantee or bond be posted in an amount with surety conditions satisfactory to the Board to ensure completion of construction of any facilities required for compliance with the Performance Standards. Existing nonconforming uses may continue without expanding or changing to another nonconforming use, but must be in compliance with all applicable state and federal requirements, including Env-Ws 421, Best Management Practice Rules. 1. Any private residence is exempt from all Performance Standards. 2. Any business or facility where regulated substances are not stored in containers with a capacity of 5 gallons or more is exempt from Performance Standards E through H.
3. Storage of heating fuels for onsite use or fuels for emergency electric generation, provided that storage tanks are indoors on a concrete floor or have corrosion control, leak detection, and secondary containment in place, is exempt from Performance Standard E.
4. Storage of motor fuel in tanks attached to vehicles and fitted with permanent fuel lines to enable the fuel to be used by that vehicle is exempt from Performance Standards E through H.
5. Storage and use of office supplies are exempt from Performance Standards E through H.
6. Temporary storage of construction materials on a site where they are to be used is exempt from Performance Standards E through H.
7. The sale, transportation, and use of pesticides as defined in RSA430:29 XXVI are exempt from all provisions of this ordinance. 8. Household hazardous waste collection projects under New Hampshire Code of Administration Env-Wm 401.03 (b) (1) and 501.01 (b) are exempt from Performance Standards E through H.
9. Underground storage tank systems and above-ground storage tank systems that are in compliance with applicable state rules are exempt from inspections under this ordinance. Where both the State and the Town of Carroll have existing requirements the more stringent shall govern. 1. For uses requiring Planning Board approval, for any reason, a narrative description of maintenance requirements for structures required to comply with Performance Standards shall be recorded at the Coos County Registry of Deeds so as to run with the land on which such structures are located. The narrative description shall comply with the requirements of RSA 478:4-A. 2. Inspections may be required to verify compliance with Performance Standards. Such inspections shall be performed by the Town Building Inspector at reasonable times with prior notice to the landowner. 3. All properties within the Acquifer Protection District known to the Town Building Inspector as using or storing regulated substances in containers with a capacity of 5 gallons or more, except for facilities where all regulated substances storage is exempt From this Ordinance, shall be subject to inspections as provided herein. 4. The Town Board of Selectmen may require a fee for compliance inspections. The fee shall be paid by the property owner. A fee schedule shall be established by the Board of Selectmen as provided for in RSA 41-9:a. Any violation of the requirements of this Ordinance shall be subject to enforcement procedures and penalties as provided in RSA 676. If any provision of this Ordinance is found to be unenforceable, such provision shall be considered separable and shall not be construed to invalidate the remainder of the Ordinance. This Ordinance shall be effective upon adoption by the Town of Carroll Town Meeting. A proposed Airport Zoning Ordinance (copy attached) was brought before the board by Evan Karpf. While he took part in the discussion, he recused himself from voting, as he is the owner of the Twin Mountain Airport. Basically, this ordinance defines the Airport Zone: location, surfaces, obstruction limitations. Evan stated if the town does not adopt this zoning the Department of Transportation will do it instead. John Sweeney made a motion to adopt the ordinance, Charles Cohn seconded. With the exception of Evan Karpf voting, the board passed this motion. The next subject discussed was amendments to Article III Section 303 District Regulations. Currently the sale and rental of OHRV�s is allowed by special exception in RES 1 Twin Mountain and RES 2 Bretton Woods. The board felt that this sale and rental should take place only in a business area. Motion to adopt was made by Evan Karpf, seconded by Charles Cohn, and passed unanimously. A hearing on all Zoning Amendments will be held Tuesday, January 17; 2006 at 7 pm in the Town Hall. An advertisement will be sent to the Coos County Democrat by December 28, 2005. At 8:45 PM, Evan Karpf made a motion to adjourn the meeting. Connie Oliver seconded the motion.